Toshiba's Satellite Pro range targets home and business users. While the L300-2CH is a bulky device with a limited specification, its strong usability and vibrant screen compensate. This laptop features a 15.4-inch Super-TFT screen, rather than a true widescreen panel. Quality is excellent, however, with impressive brightness, colour and contrast and sharp images. The screen is as suited to entertainment use as office work. The plain black and silver chassis is designed to provide a degree of anonymity for corporate users. As a result, it lacks the eye-catching style of the Advent Roma 1000 or Hi-Grade Notino W5900. Build quality is fantastic, however, and easily matches the resilience of the eMachines G725 chassis. This resilience is, in part, due to the L300's bulky dimensions. Despite this, however, the 2.6kg chassis suits basic travel use. This is aided by the 194-minute battery life, which will let you keep working on short journeys or around the home. Usability is a key strength of this machine with the keyboard proving extremely comfortable to use. All the large keys feature tapered edges and respond with a reassuring click and a smooth and responsive typing action, although there is a slight flex to the board. Performance is average, but matches up to all but the eMachines G725. The low-powered Intel Celeron processor provides enough power for most basic home and office use but, as with the Advent, struggles with anything more taxing, particularly when multi-tasking. Storage is also comparatively limited. The 160GB hard drive will suit most daily use, but is significantly bettered by the Hi-Grade and eMachines. 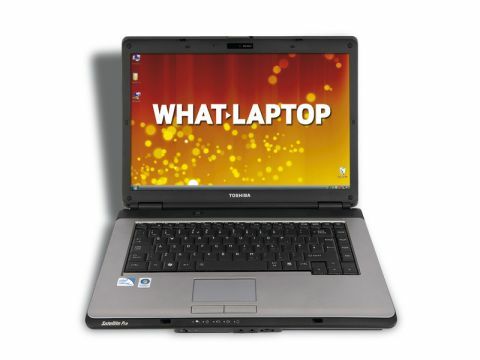 A dual-layer DVD rewriter is present, but this laptop has no support for media card formats. Three USB ports are provided for connecting external peripherals, but unfortunately two of them are placed far too close together. As a result, one large peripheral could block the second port. An integrated webcam is also fitted for recording live video and taking photos. First-time buyers will appreciate the included software package. Internet security and DVD creation applications are installed, as are proprietary maintenance tools, making it always easy for beginners to run and optimise their machine. At such a low price, the great usability and screen of the L300-2CH make it a good choice for first-time buyers. Its limited specification, features and awkward port placement make it a flawed machine, however, so tread carefully.